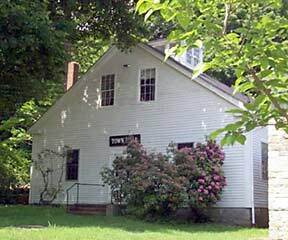 The Museum, Edith Mason Library, and Office of the Mansfield Historical Society are located in the Town of Mansfield’s old town hall buildings at 954 Storrs Road (also known as Route 195) in Storrs, CT.
Mansfield’s historic Town Hall and Meeting House. The museum and library are open on Saturdays and Sundays, 1:30 – 4:30 p.m., June through September and at other times by appointment. To make an appointment please call the museum at (860) 429-6575 or use the contact form to send your request by email. Admission: $2.00/person. Free to members and children ages 12 and under. Tours & School Programs: Special tours and school programs are available with prior arrangement. Please contact the Museum Director for further information. Drive south on Route 195; cross Route 44 and continue south. After one mile pass through the University of Connecticut campus; you will pass Route 275 on your right, at a stop light. Continue south on Route 195 for another 1.3 miles. The museum is located on your left, across from the Altnaveigh Inn & Restaurant. Turn left and park in the rear. Leave Willimantic and head north on Route 195. 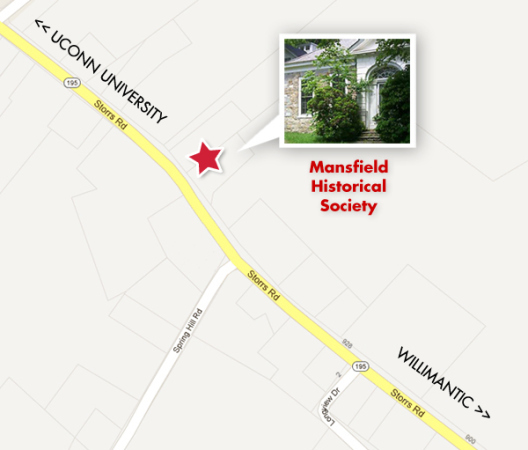 In Mansfield Center, you will pass Route 89 on your right, at a stop light. Continue north on Route 195 for another 2.3 miles. At the top of Spring Hill, the museum is located on your right, across from the Altnaveigh Inn & Restaurant. Park in the rear.